Where is Bob? : Quicken Loans Blog — Biggby Birthday Love ! Quicken Loans Blog — Biggby Birthday Love! They must know about the BIGGBY COFFEE way...or the free tall beverages that BIGGBY gave away yesterday. Either way, who cares! 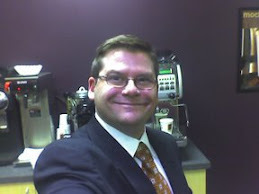 BIGGBY rocks! Hmmm. Did you notice in the Quicken posting that the first thing mentioned was "Michigan company?" I believe that business people underestimate the importance of this. You can't build a company on that foundation alone. People and product are still what separates the successful from the unsuccessful. Assuming a company does a good job on the people and product front, the next determining factor ought to be whether we are neighbors. Michigan neighbors. That was a fun little blog post--Thanks, Quicken! I'm all for the list-style blog post, and yep lost roughly 3 days of my life at the end of 2009 reading all of the best-of-the-year and best-of-the-decade lists on movies, music, books, etc. 8. They also have lots of super yum non-coffee drinks, like the Orange Creme Freeze and the Mellow Hot Chocolate. 9. 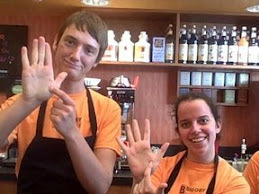 They have a monthly photo contest on www.bhappylounge.com (where they also periodically offer free swag to customers) where customers take Biggby-themed shots and compete for a monthly $100 gift card. 10. They are firm believers in giving back to the community--their B-Involved programs are run both company-wide and by individual franchisees in their communities, raising funds for charities.